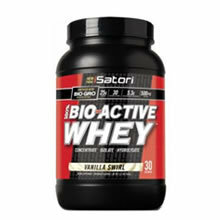 If you'd like to see if 100% Bio-Active Whey (Vanilla Swirl) contains substances that are banned by your sports organization's Banned Substance List, sign up now or log in. Declared Ingredients Calcium, Sodium, Bio-Gro™ Bio-Active Peptides (Extracted from micro-concentrated colostrum, yielding: Proline Rich Peptides, Growth Factors, Immunoglobulins, Lactoferrin, Fibroblast-GF). Other Ingredients: High Biological Value Protein consisting of Whey Protein Concentrate, Whey Protein Isolate and Whey Protein Hydrolysate, Natural Flavor, Xanthan Gum, Sucralose, Salt. Contains ingredients from milk and soy (lecithin). Have a question about 100% Bio-Active Whey (Vanilla Swirl) Use our secure online messaging system to ask our Aegis Shield Experts.